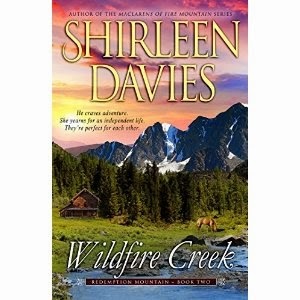 Shirleen Davies' "Wildfire Creek," book two in the Redemption Mountain series, is a historical western romance that follows the story of two characters in the frontier after the Civil War. After a demanding career in the military, Luke Pelletier moves to the mountains, determined to lead a relaxing life on his ranch as an untethered bachelor. Luke's dreams change when he meets Ginny Sorensen, a determined, resilient young woman, who works at the local saloon. Luke and Ginny have great chemistry, but there's a lot to work out if they're to have a relationship. Davies does an excellent job capturing the feel of the era and the scenery of the mountainous environment. The plot has plenty of twists and turns to keep you interested, and the characters are engaging. If you like historical romances, take a look at "Wildfire Creek."